The other night I was watching Hasan Minhaj on Netflix and picked up some fascinating tidbits about a staggeringly successful, globally influential company I’d never even heard of . In this show about the economics of streetwear , one of fashion’s hottest trends, I learned the brand Supreme is both super hip and maybe selling out. Supreme, which makes t-shirts, hoodies and various accessories, originated in 1994 at a New York City skateboard shop. It caters to young males, highlighting skateboarding and hip hop. Supreme’s website (link) says it has a unique identity and attitude that embodies young counter culture, defying convention, while offering quality and authenticity. Check out the cheeky lookbook Farmland Foods put together in response to Supreme hijacking their pastoral logo. Ironically the company that built an empire using other people’s work sues when it happens to them. “The beauty of fashion is that it’s conspicuous; everyone knows what you’re wearing, so if you’re wearing a scarce, fashionable product, you get the benefit of knowing privately that you own something scarce, but also the benefit of being able to show other people that you can own a scarce product. “ explains Adam Alter, the author of Irresistible: The Rise of Addictive Technology and the Business of Keeping Us Hooked. Alter was defining the hype beast and hype beasts are very critical of brands that compromise whatever cool essence they have sought to cultivate. “Once a brand loses exclusivity, people shy away from it,” says Walter Harvin, editor-in-chief of Uncommon magazine, a publication for young artists in New York City. And now we have the Carlyle Group, a huge investment banking corporation that buys and flips all kinds of companies for profit – the ultimate reseller. Carlyle, who is involved in everything from donuts and hamburgers to oil drilling and fighter jets bombing Yemen — not at all cool or ‘authentic’ – has quietly bought out roughly half of Supreme. It’s believed Carlyle will try to grow Supreme’s business quickly. When that happens, large numbers of ‘scarce’ t-shirts and hoodies could flood the market. Does that mean Supreme’s reputation will then collapse? Maybe the Supreme/Carlyle collaboration isn’t a mistake in marketing or media relations, it will undoubtedly make its creators and purveyors a great deal of money in the short term. But it’s definitely looking like greed is all set to kill the golden beast. If you build your reputation on being hip and exclusive, selling out to a not-at-all hip, monster corporation may just kill your street cred and your reputation. Mind you, if a middle aged lady like me is talking about it, Supreme has probably drifted pretty far from hype already. Yesterday was International Women’s Day, a a global day celebrating the social, economic, cultural and political achievements of women. So in honour of that, today’s blog post is about how to create messages aimed at women. And a hint, it’s not just to write them in pink ink. In case you don’t understand why this is a bad idea, let me explain in easy words. By making a pen for only women, you are implying that the pens you made before were only for men, or perhaps that women were unable to use the ‘men’ pens, or that if a woman used a ‘man’ pen she would do it wrong. Getting the words of your messages right is incredibly important, but the words you select also have implied meanings that must be considered. Now I love a pink or purple pen as much as anyone, but by marketing these pens directly for women, Bic created implied messaging that didn’t paint their company in a favourable light, especially not with those who care about gender equality and feminism. Pens are pens, and you don’t need to be a certain gender to use certain pens. We’re not talking about the fit of work boots or underwear. If Bic felt inclined to sell more pink and purple pens, they could have simply sold pink and purple pens, without perpetuating gender stereotypes that most women in this decade thought were in the past. Now that the internet has taken over the way we absorb information, we have entire new industries cropping up that generate “content.” Content used to come primarily from printed sources — books, magazines, newspapers, etc. Then radio and tv, but now from everywhere and everyone. Naturally the credibility of the content we find online varies, to say the least. But generally, we still rely on mainstream journalists to give us some level of credible, ethical writing. At least, some of us do. So clearly this is not journalism. People will pay for content marketing, but you can’t pay a journalist directly to write about you. At my journalism school we were taught about the horrible error of “business office must,” where the ad sales guys try to influence who or what gets covered in the paper, but we ethical journalists push back for our neutrality. PR people understand that, which is why we pitch reporters, hoping to get their attention, but don’t pay them for coverage. 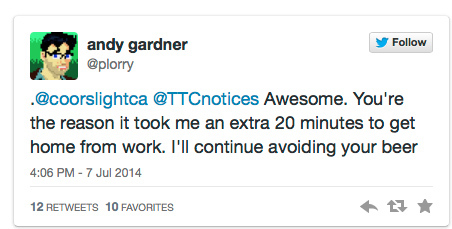 But content marketers have not all learned that. 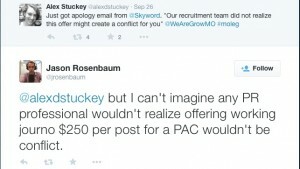 Take the case last fall in St. Louis, Missouri, of a lobby group, Grow Missouri, that offered to pay journalists to write blog posts promoting their tax reform messages. A representative of an agency working for Grow Missouri emailed reporters asking them to write blog posts for the lobby group saying lovely things about Grow Missouri. but these are the same reporters who usually cover the issues in which the group is involved. So to be clear, this is NOT good PR, nor is it ethical PR. But then again, it wasn’t really PR at all, was it? It was an attempt at content marketing, but with the wrong writers. And what happened? Well, the reporters who were approached laughed, ignored, and then posted the emails they were sent by Grow Missouri and blogged about how wrong they thought this was. So of course that made it worse, because now it was public. 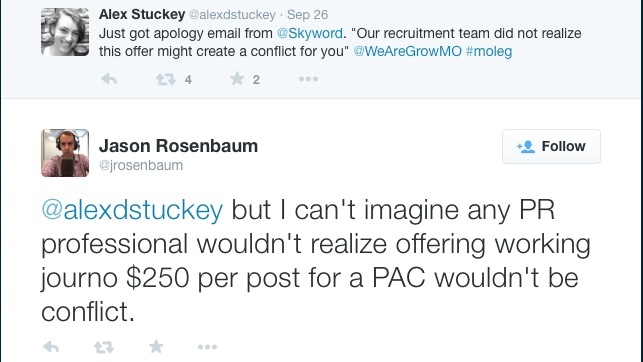 The agency that sent the emails apologized, but by then Grow Missouri had fired them and they weren’t smelling so sweet in public opinion. …we mistakenly contacted five journalists who cover politics, asking them to write articles that would appear on our client’s blog. Our team did not realize the conflict that this would cause for these individuals. The issue of journalists being in conflict comes up all the time (watch for a later post from me on the CBC’s recent troubles with one of their ‘journalists’), but this story just goes to show that while the internet may have changed how we get our content, the credibility of mainstream media hasn’t changed, really. And that’s a good thing. When marketing people look for big ideas, they often come up with some kind of stunt, hoping that the event attracts media attention (online or mainstream). 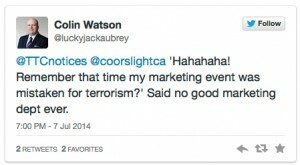 These stunts are attractive to marketers for their “PR-value”, as in “Think of all the free PR we’ll get.” And yes, sometimes they work and brands get a lot of good attention. But sometimes, the attention isn’t really the kind the marketer had in mind. Take for example Snapple’s idea to promote its new line of frozen treats in 2005 through attempting to set a Guinness World Record by erecting a 7.62-metre-tall popsicle in New York’s Union Square. It was a summer day, and guess what, the giant popsicle melted and turned into a sticky pink mess. Snapple flooded Union Square with 1.75 tons of kiwi-strawberry-flavoured melting juice, with the liquid gushing out of a truck that was meant to haul the giant popsicle to the area. Pedestrians fled, police and fire departments were called to the area, and Snapple officials stopped the Snapple-raising at a crowd-disappointing 25-degree angle — no record, but lots of media coverage. The mushy giant block was then trucked away and a television-sized ice sculpture in the shape of the Snapple logo took its place, while city workers had to hose the area down. Of course, this lesson could have been learned by marketers a century earlier. This kind of thing goes back a long, long way. Take for example, the Crush, Texas train crash of 1896. Before the turn of the last century, a marketer working for the Missouri-Kansas Texas railroad, known as the “Katy,” had the idea to put on a big train wreck as a spectacle. This was the brainchild of William Crush (I didn’t make that up! ), the man in charge increasing passenger sales on the Katy. He noted that train wrecks held a morbid fascination for many people, so he convinced his bosses to stage a head-on train collision and invite the public out to watch. Crush chose an isolated spot in Texas, where two aging locomotives each carrying a few surplus cars would crash into each other after their crews jumped to safety. The area offered hills on three sides where the public could watch but be “safely” away from the crash. They built the track, a station platform, and grandstands, bandstands, a midway, and more to house the spectators. Media ate up the story and gave the event a lot of publicity. While viewing the crash was free, the railway charged a reduced train fare to the crash site ($2 from any location in Texas). On September 15, 1896, nearly 40,000 people showed up in the new town of Crush, Texas, temporarily making it the second-largest city in the state. At 5 pm, with the hills crowded with onlookers, the two trains got the signal and took off towards each other and the crash point. In moments there was a deafening sound and the big crash, but things didn’t go according to plan. The two engines telescoped together, their boilers exploding at once, sending “flying missiles of iron and steel, varying in size from a postage stamp to a half a driving wheel. Tens of thousands scrambled to avoid the iron and wood debris catapulting through the sky. Distance was no guarantee of safety; debris peppered the crowd and pocked the earth as far as 300 yards away. (From history.net) Three people died, and many more were injured. Still, you think marketers would learn from this train wreck of an idea and be more cautious when planning their next stunts. Can you imagine how that train wreck would have played out today, with everyone tweeting and instagramming photos from the disaster? Not a good PR move, I think. Everyone’s a critic, but should every criticism worry you? I saw a news report about a brand that got in hot water for a free concert they threw in Brooklyn. The concert was sponsored by Levis, the jean company, and the “price” of admission was to wear an item of Levis clothing. The news report said “dozens” of fans were turned away for not wearing Levis. Okay, I thought, another example of a campaign gone wrong. People must have been all up in arms over this. Social media must have been buzzing with negative comments. The brand probably reacted. But no, not really. And that has turned out to be the real lesson here. Here are the facts: Levis sponsored a free concert in Brooklyn, NY, with popular indie rockers Haim and Sleigh Bells to launch a new marketing campaign “Live in Levis,” where consumers are asked to upload images or write posts about their favorite moments wearing Levi’s products. On ther website, Levis said that in order to get in to the outdoor concert venue, you had to wear Levis clothing. The concert was a huge success, with big crowds and big buzz for the brand. But unlike some other marketing promos we’ve seen, Levis actually enforced the “wear Levis or else ” dictum and did turn people away who weren’t sporting their brand. But was it any of those things? I think not. Brand fans were thrilled, if the concert reviews and positive posts from the few days around the concert show. The only ones saying it wasn’t a great experience were a handful of turned-away fans in Brooklyn and the Daily News. Oh, and of course all those PR and marketing critics out there. I applaud Levis for not caving to these few voices and making more of it than it really was. If this was a genuine backlash, with real media (mainstream or social) reaction, then the company should respond and manage the media crisis. But if the reaction is this small and controlled, sometimes you gotta let the critics have their say without responding, and just rock on. 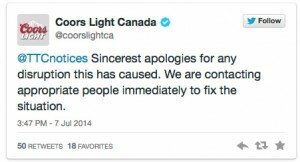 From the “What were they thinking?” file, and the “Those who fail to learn from history are doomed to repeat it” file, comes the story of Coors Light’s campaign in July 2014 for Search and Rescue. A promotional campaign to get beer drinkers engaged with the brand on social media and in real life, Coors Light Canada created Search and Rescue, where they hid a bunch of briefcases around the country, and mapped them on a website. Players (age of majority only of course!) searched for them and if found, posted a photo with the briefcase and then won prizes. However, in Toronto, this backfired in a huge way. 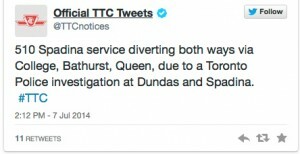 On a busy workday during rush hour, someone called in a suspicious package at Dundas and Spadina in Toronto — major intersection — and the bomb squad was called. The road was closed, cars and buses diverted. And what was the package? Why a Coors Light briefcase of course. 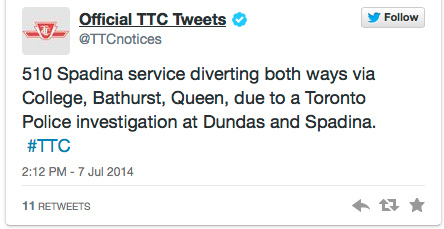 The Toronto Transit Commission, and a lot of twitter users, were not amused. Yah, not the most thought-through idea a beer company ever had (insert your own joke now about consuming too much of their own product while designing this campaign). You’d think someone would have researched this kind of thing ahead of time. If they had, they would have stumbled upon a campaign from 2007 by the Cartoon Network for Aqua Teen Hunger Force, a late-night cartoon show. Then, more than a dozen electronic devices with blinking lights were found throughout Boston and were mistaken for bombs. Highways, bridges and a section of the Charles River were shut down and bomb squads were sent in before authorities declared the devices were harmless. Two men were arrested for putting up the devices, which were only supposed to promote the cartoon show that featured a talking milkshake, a box of fries and a meatball. Just like in Toronto this past summer, the same blinking lights had been in place for a few weeks in nine other American cities with no trouble, but it’s the Boston ones that made the news. Leaving aside that this beer company appropriated the hashtag #searchandrescue, which is used on Twitter to discuss real Search and Rescue activities, where people are lost in the backwoods or in natural disasters and professionals search for them (I’m just waiting for that social media backlash), Coors Light didn’t plan very well for the kinds of crises a marketing stunt like theirs could create. 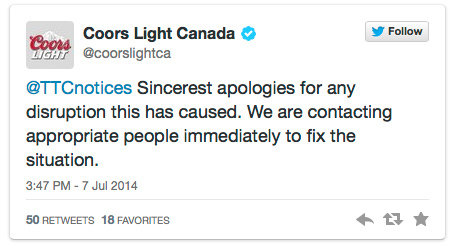 Beer companies will always do stuff like this, but crisis planning should think through stuff like this.